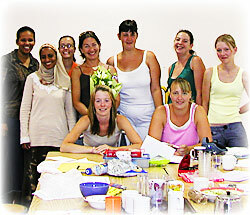 In my experience of working within group settings such as adult education classes and workshops for statutory, private and charitable agencies, I provide handouts and teach theory and practice but also promote the sharing of experiences and have found this to be a great catalyst for self-development, boosting confidence and self-worth and enhancing social and self-care skills. I do not believe that I have ‘all the answers’ within classes or workshops and always encourage participants to negotiate what they want and recognise and share their own skills and wisdom. I also attempt to provide tools for individuals to learn and find a way forward most suitable to them as unique people. I always attempt to be non-oppressive in my practice, irrespective of gender, race, culture, sexual orientation, physical and psychological make-up, age etc. My workshops are tailored to individual requirements and aim to be professional, challenging and engaging, whilst incorporating humour and fun as much as possible. I sometimes utilise creative techniques, from awareness-enhancing ‘experiments’ to art, drama, music, movement and writing. “ Somewhere over the rainbow, way up high.